Chunky Peripherals(previously known as CRMod) is a computercraft addon that focuses on chunkloaders! Every turtle that has this upgrade equipped will keep it's chunk loaded. To mine you have to use the peripheral's methods dig, digUp and digDown. This is a computer peripheral that acts as a chunk loader. By default (even if not attached to a computer) it will keep loaded the chunk it's in. By connecting it to a computer you can change the shape of the loaded area. The possible shapes are: a circle centered on the peripheral, a square centered on the peripheral a rectangle centered on the peripheral and a generic rectangle around the peripheral. The shapes sizes are expressed in blocks not chunks, so if you set for example a circle of radius 19 all the blocks that are less than 20 blocks away from the peripheral will be kept loaded. returns a string descripting the current shape. sets the shape to a square of the defined size centered on the peripheral. sideLength: length of the side of the square. has to be positive. Non-integer values will be rounded up to the next integer. If odd will be rounded up to the next even number. sets the shape to a rectangle of the defined size. The parameters define the distances of the sides from the peripheral. All arguments have to be positive. Non-integer values will be rounded up to the next integer. north: distance of the north side. east: distance of the east side. south: distance of the south side. west: distance of the west side. returns the number of chunks the peripheral is keeping loaded. returns a list of the chunks the peripheral is keeping loaded. disables the peripheral, it wont keep loaded any chunk. To re-enable it you have to set a new shape. returns the documentation of the methods. command_name: string representing the name of the command. argNtype: string representing the type of the argument N.
Remember you can use the peripheral's help command to get the documentation of a method in-game. This upgrade is a wireless modem that keeps the chunks loaded like the chunky module. The chunky detector is a handheld tool to chek if a specific block is kept loaded by Chunky Peripherals. By right-clicking on a block you will see on the chat if it's loaded or not. The command /CRModListLoadedChunks will print on the console the list of the chunks loaded by this mod. Each ticket corresponds to a turtle, it'll print between square brackets the chunk's coordinates and then the corresponding normal world coordinates at which the chunk starts. In the config file you can change the item ids, the upgrade ids, enabling an alternative recipe for the chunky module that uses a diamond instead of the ender pearl, and activate the debug logging. Edited by _CR_, 28 April 2017 - 09:49 PM. I already thought of doing that but honestly I don't know how to do it. In the computercraft's api i don't see anything about wireless so it isn't be simple to interact with it. A solution is that with computercraft 1.63 you should be able to switch the attached peripheral using the turtle.equipLeft() and turtle.equipRight() methods. It seems unequip chunky module would be risky. And modem's function quite restricted if unequipped. thanks for you work CR. writing rather extensive turtle-progs i have been looking for a good chunkloading-solution for quite a while. a chunkloading one is unpractical too. appreciate if you thought about it. which at 20 turtles and up becomes rather unmanagable. especially as players tend to forget the loaders on the finished digging sites. the problem is that, from what I understand, the only way to extend the turtles the api provides is creating turtle upgrades (so I can't create a new type of turtle with two free slots) and I can't extend the existing modem upgrade because it isn't included in the api. So I would have to make my module capable of using the wireless, but also this isn't in the api. Not following the apis would be a big mess. "[SEVERE] [ForgeModLoader] The mod CRMod attempted to force load a chunk with an invalid ticket. This is not permitted." That's strange, it never happened to me and I tested it a lot... Which version are you using? It happened after some time you installed the mod or from the first time? It's only a turtle that do this or it's all of them? i gave it some more thought and looked into some CC-mods' sources. how about making chunk-loading pickaxes (aso) instead of re-implementing modems or turtles. it seemed to me that the standard tools that turtles can use would be the simplest form of peripheral, their workings are known. may sound a bit silly to have a chunkyloading-pickaxe, and i got no clue if behaviour of a pickaxe for players and turtles could conflict. but it would take away that 'closed-source'-problem with modem/turtle-chunkloaders. 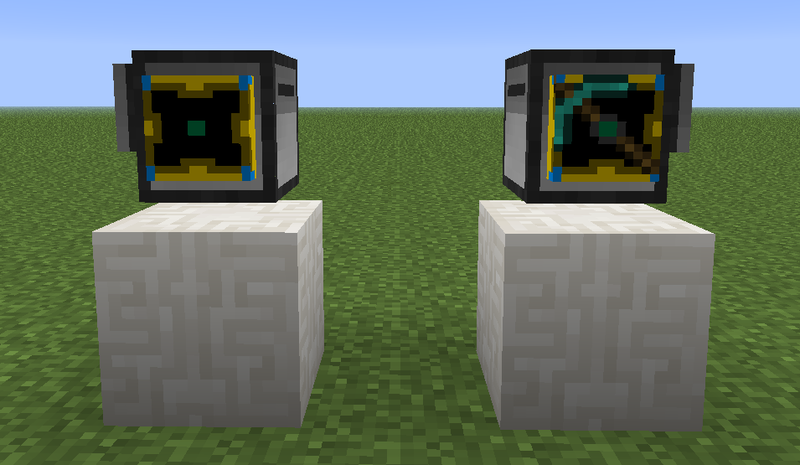 for recipes your chunky-modules and a diamond tool would give diamond-chunky-tool, maybe with a nice texture like the module's one as a bonus. nice, nice, I didn't think of that! simple and useful! I'll work on that! Have you done any work with 1.64 (MC 1.7.2) as of yet? I was just looking around for something like this and was very pleased to see it. No, nothing yet. Now I'm working on the mining chunkloader (miny chunky module), and solving some bugs. Then I'll probably start working on the upgrade to mc1.7.2 and cc1.64. I expect to finish the new version in a few days! Edited by _CR_, 19 June 2014 - 02:58 PM. Set chunkloading range in meters with corresponding fuel demand. ...Then I'll probably start working on the upgrade to mc1.7.2 and cc1.64. I expect to finish the new version in a few days! I'm waiting for 1.72 version. Good luck. you just made my day. Well, in fact, you probably just made my whole weekend. After some updating, the mod works smoothly on my server, which is a 1.6.4 cauldron-server with about 120 mods. I had to update Cauldron, Mobius and Waila to latest version to have the chunky module not detach upon player leaving the circumference. (I don't think that was a problem with your mod - other stuff was behaving weird too). Upon first tests everything works as expected, the wrapped peri digs nicely, and the test-turtle has moved through unloaded terrain a ton of times without incidents. I will spend some time this weekend making the LUA of my turtle-system a bit more presentable, and see if it works well enough to publish. 15:32:47 [INFO] PLAYER left the game. Other chunkloaders will continue to work at that point. MinyMod will not detach if player just moves away but is still online. However it seems the MinyModule does not really use ChickenChunks tickets (however those work), as /chunkloaders shows the chunks with miny-turtle in it as loaded, but not as forced/ticketed - as it is with all other chunkloaders i have available. Edited by ninnghazad, 04 July 2014 - 09:15 AM. That doesn't happen on my test server (its a simple server with only computercraft and my mod so it could be quite different from a 120 mods server...). I don't use chickenChunks I directly use the forgeChunkManager from the forge api (that uses forgeChunkLoading.cfg in the config folder). It's strange the peripheral gets detached because the ticket shouldn't be bound to the player. The turtle was in the area loaded by the player when you rejoined? it re-attaches also if you are far from it? after trying some more i can say the problem is pretty random so it's hard to figure out whats actually going on. on distance, it seems to make no difference how far i am when dis/reconnecting, or if another player is around. can't say if actually related or comorbidity though. if working, the turtle leaves a trail of loaded chunks, which stay loaded as far as i can see. i fear i might have something installed that messes with the fml-chunking, maybe trying to provide improved unloading, that won't go along with the minys. will keep trying to get it to work correctly. Edited by ninnghazad, 04 July 2014 - 09:12 AM. the fact is that the ticket that keeps the chunks loaded isn't in any way bound to the player, it doesn't have an owner. So when the player disconnect it shouldn't change anything. I asked about the distance to understand if the turtle gets loaded because it's in the chunks loaded by the player or because it's bound to him in some way. And those errors... I don't know what they are, java.lang.Throwable is the most generic error possible, it could be anything and I can't find anythig about those cauldronhooks classes (googling it I find this same thread....). also the stacktrace doesn't even pass through my mod classes. So, I'm sorry but I don't know. Edited by _CR_, 06 July 2014 - 11:54 AM.